I absolutely love Autumn. Even though here in Britain its always a bit of a surprise to get those beautifully crisp Autumn days we all dream of, I always cherish them when they come along. Autumn is the season where comfy sweaters begin to reappear but its still acceptable to wear cute dresses without freezing- my favourite! 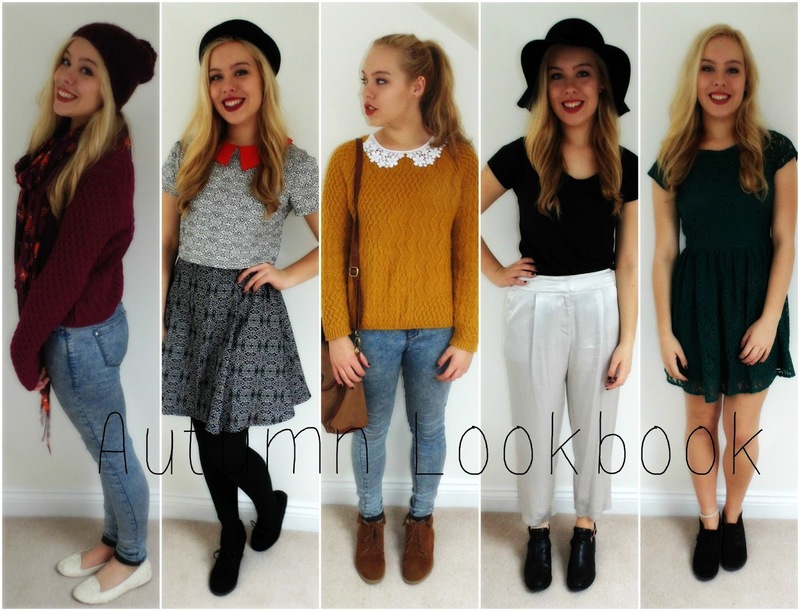 Today I'm going to show you five of my favourite Autumnal outfits! Gem stone colours are my favourite during this season. This emerald green lace dress is perfect to dress up or down for every day use. I also love my leather look jacket which I wear so much! It easily smartens up a jeans and t-shirt look or, as done so here, with a cute dress. This is my favourite look to wear to school during the chilly Autumn months. Layering clothes is a great way to stay warm and also adds amazing textures to an outfit. Here I have layered a jumper over a thin sleeveless collared shirt to create this contrasting collar look! Tan is a great neutral colour to add to different autumnal outfits as it matches with pretty much everything- here I have tan boots and my trusty tan satchel bag. Although days of sunshine and crisp air may be few in England during Autumn, this outfit is great for then! These metallic, silky trousers are a huge risk for me as they're quite bold (which usually scares me) but I love these trousers so much and I've finally got the confidence to style them! I think that this outfit is chic yet smart; perfect for a day of shopping! Other colours that I adore during Autumn are berry tones: burgundy, purples, crimsons... the lot of them! 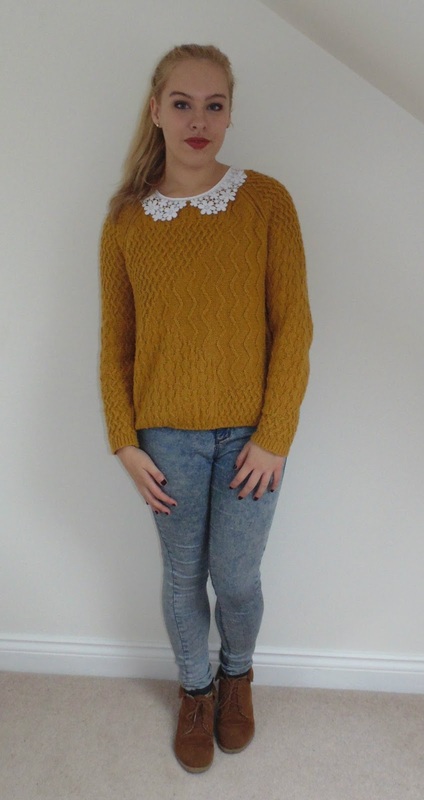 I love the different textures in this jumper because of the variation in knits. 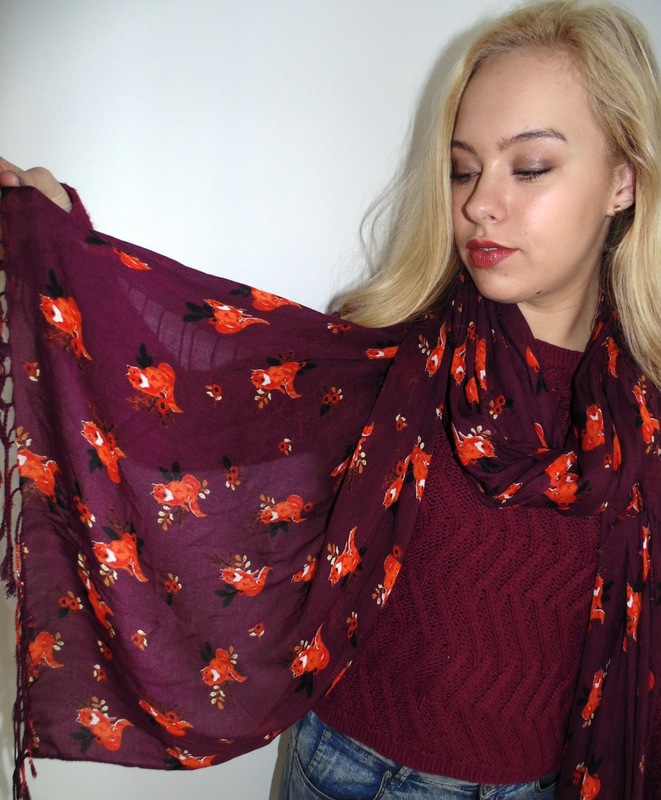 The print in my scarf is adorable- little foxes. For some reason, in Autumn I become addicted to cute animal prints... foxes, owls and fawns in particular. My bag was only £5 from Accessorize as it was broken but we fixed it so easily... so this super inexpensive bag (with a deer decoration and in my favourite emerald colour- bonus!) finishes this look perfectly! Maybe this outfit doesn't scream Autumn when you first look at it but its perfect for days where you want to easily look smart. And with a pop of colour of the bright red collar, which I paired with a matching red lip, it makes the look very interesting. I love the structured A-line skirt of this dress as its totally different to any other dress I already have. I love your red lumper and scarf!